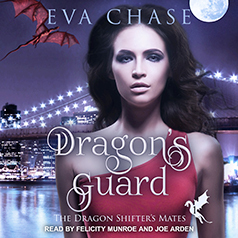 Eva Chase presents Book 1 of the Dragon Shifter's Mates series. Contains mature themes. When Ren Landis goes looking for excitement on her twenty-first birthday, getting kidnapped is a little more than she bargained for. So is finding out that shifters exist—and that she's one too. As the last of the dragon shifters, she's got a role to fulfill: Take the alphas of the four shifter groups as her mates and unite all shifter kind. No pressure, right?